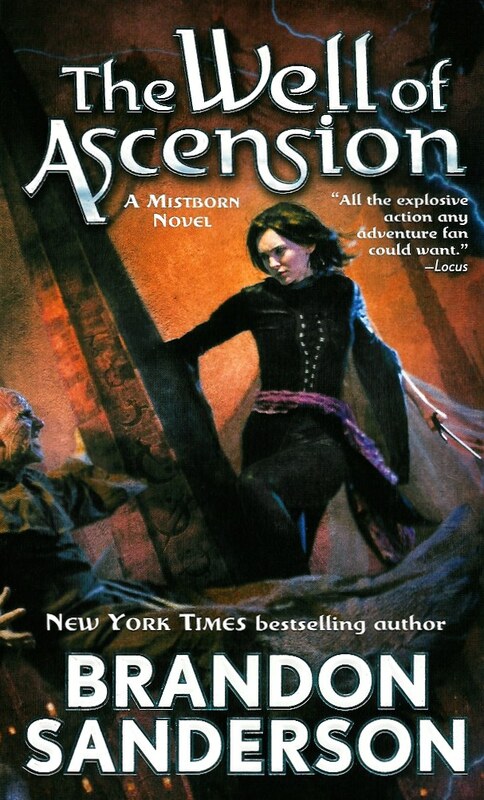 WARNING: THIS IS THE SECOND BOOK IN THE MISTBORN TRILOGY. IF YOU HAVEN’T READ THE FIRST ONE, GO CHECK OUT MY REVIEW AND READ IT. THIS REVIEW–AND THE SUMMARY–CONTAINS SPOILERS. Mistborn: The Final Empire, was everything the first book in a trilogy should be. It had all the action, intrigue, and cool characters it needed to get me booked on the series. The emotional beats were great, and it demanded that I read Well of Ascension immediately. Well of Ascension caught me off guard a little bit, though. It’s not the same book that Mistborn was. Sanderson took a dangerous route by changing up the plot structure, and though the world itself still has the same dark atmospheric feeling, the book itself feels very different from the first. As expected, Sanderson managed to pull this off with aplomb, crafting yet another thrilling tale. While Mistborn was a tale of thieves trying to overthrow an empire, a tale of the dark alley ways and shadowy places of Luthadel, Well of Ascension is a political novel and a war novel. With the Lord Ruler and Kelsier gone (I did warn you about spoilers…), and funds running low, the remainder of the thieving crew must try their hand at running an empire, a task that is proving even more difficult than overthrowing it. An old villain comes into new prominence, and he’s very nasty. Straff Venture, Elend’s father, is one of the generals who is leading an army against Luthadel, trying to claim the city—and the empire—as his own. But he’s not alone. Others want the city too, and they’ll stop at nothing to get it. The impending armies give the book its main sense of drive, and for the most part, they’re enough to keep it going. Elend is forced to play the part of king, and the novel delves deeply into what this really means, and what the politics of the Final Empire might really look like. I must admit that I found this element of the pacing slow at times, and these were some of the least enjoyable sections of the book. The rest of the book more than made up for it, though. Vin, growing every more confident in herself and her powers, is up to her usual mistborn antics, and there are plenty of nerve-wracking fight scenes, including two of particular note. The first is still one of the bloodiest, most revolting massacres ever, and I love it for both the visual aspect and the impact it has on me—and the characters—every time. The other, well. Let’s just say it involves Vin, a lot of iron, and a very large sword, and ranks in the top five scenes that I want to see on the big screen. Heck. I’d pay for an entire movie just to see that one scene. But that’s not to say that the awesomeness is limited to our favorite mistborn. The whole crew from the first book is here, and there are plenty of new additions. The old characters gain new depth—in particular, Sazed continues to develop into one of the best written non-religious (or poly-religious, I’m not sure) characters I’ve ever read, and I truly admire Sanderson’s ability to write viewpoints he disagrees with so very, very well. Everyone gets their own scenes in which to shine, and the variety of the cast makes it an entertaining book. My favorite character, perhaps because his situation is the most relatable, and because I can understand why he takes every action that he does, is Spook. And, as you saw in Mistborn, nobody is safe. The feels that Sanderson unleashed on page 573 of Mistborn (Kelsier. Yes, I have the MMPB page number memorized. 588 in the YA TPB edition.) are a good indicator of what is to come. With a whole host of armies sitting around, all of whom want the same thing, you really can’t expect everyone to survive. Have the chocolate ready, especially as you approach the end. And what an ending it is. While Well of Ascension is the middle book of the trilogy, and almost by necessity, is a little slower than the other two, the ending is still a completely amazing piece of work, and the number of twists and surprises that Sanderson pulls really make it utterly thrilling. And it’s not over until the last page. The last time I saw someone read this book, she went from amazed to horrified, to swearing she would never read Sanderson again to crying from happiness, to demanding Hero of Ages immediately, all in about 10 minutes. This is a fairly typical reaction. In summary, The Well of Ascension, the second book in the Mistborn trilogy, is another triumph for Sanderson, and while it feels slow at times, it has some of my favorite scenes ever, and adds depth to pretty much every character in the series, all the while raising the stakes constantly and building towards a surprising, twisting ending that will leave you demanding the third book as soon as you can get your hands on it. Five of Five stars.